At Time For Change Personal Training we just recently we added battle ropes and kettlebells to our repertoire of tools to use as part of our fitness programs. I wanted to briefly explain what each of these are and why they’re so beneficial to your workout routine. Battle Ropes provide are an unbelievable exercise tool that provide an intense workout for improving muscular strength, endurance, cardiovascular conditioning, have substantial fat burning properties, and will get your heart rate going immediately. They also help increase aerobic and anaerobic capacity, are a low impact cardiovascular training tool, and gives you a full body workout including great conditioning. We can easily adjust the workout intensity for individual ability, size, and strength, so ladies, this is for you too. Kettlebell exercises will increase your heart rate much like the standard cardio exercises, but also works every muscle group in your body. These exercises are movement-based, not just lifting-based, so you get a full body workout every time. 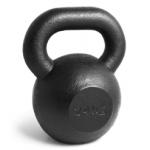 The kettlebell also replaces many of the individualized bars, dumbbells, and cardio equipment. 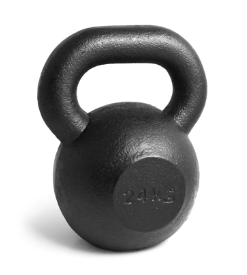 Again, we can adjust the weight of the kettlebell and movement being done to accommodate for any individual persons need. 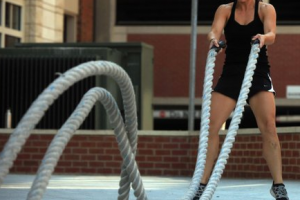 Want to experience the safe and proper way to use battle ropes and kettlebells for yourself? Then join us at Time For Change Personal Training or our Fitness Groups offered four times per week. Lastly, I wanted to share with you some of my top fitness tips….enjoy and Keep Movin’! Make sure you warm-up prior to any exercise activity to help protect the body from injury. The purpose of the warm-up is to get your joints “lubed up” with synovial fluid and to increase your body temperature. Walking is good for you, but this activity shouldn’t be your primary workout. Use walking in addition to your fitness program. Try challenging yourself with exercises that incorporate all of these components: endurance, flexibility, cardiovascular fitness, balance, and strengthening. The amount of intensity you perform during your exercise routine will affect your fitness results. If you’re working out 4 times per week for an hour each that’s 240 minutes. You can increase your intensity and decrease the amount of time working out, and you’d get better results. We’re all very busy these days with family, work, and such, so make every minute count during your workouts. Using good form and having good body posture when doing exercises is very important to help prevent injuries. Keep your chest and chin up and pull your shoulders down and back will help prevent the misalignment of your spine and joints. Always keep your core tight (tummy pulled in) throughout all exercises, but don’t forget to keep breathing the correct way. If your main goal is to lose weight, you’ll need to focus more on resistance and strength training then on cardio. This will help you increase muscle mass quickly which in turn will help increase your metabolism to help you burn more calories faster. Cardio is still important for the heart and the cardiovascular system, but it’s not as efficient for weight loss. You must be consistent and stick with it if you want to see results. Try to set a goal at the beginning so you have something to work for that will help you push a little harder each workout, then update your goals as needed. Make sure you track what you’re doing so you can see if you’re making progress in your fitness goals. Want great abdominal muscles (or the famous ‘6 pack’)? You can’t just do a bunch of abdominal exercises and expect a cut, lean stomach. If you want great abs, follow this recipe: 80% percent of what you put into your mouth (the nutrition that you’re fueling your body with everyday) will impact the amount of fat that you carry around your mid-section, the other 20% will come from doing full-body workouts to decrease your overall body fat percentage, and increase muscle tone. Hitting plateaus can be very discouraging and happens to all of us. Break through these plateaus by increasing your exercise intensity, lift a little heavier weights or change up the routine by changing reps/sets, run and cycle faster, get more rest, and change your nutritional intake. Make sure you drink plenty of water and feed your muscles after working out with protein. You just spent time tearing your muscles down (which is what you’re doing when you exercise), so now you need to give them the nutrients they need to build the muscle back up. Supply your muscles with high quality protein within a half hour after your workout. So what are you waiting for? Get started on a exercise program today by clicking on the Time For Change Personal Training Services tab to see what will work best for you. Your first step is to just decide, then take action!